And where am I? Your beloved wife. Woman who bore you 8 children? Yes, count them. 8. On this day of days Paul, let me remind you of just who did the work of revolution in this fair city. Was it you and your friends? Oh, perhaps as recorded in the poems and histories of the events. But we both know who it was. The wives. The wives who spun and sewed the clothing. The wives who cooked and served meals and drink for children, friends and co-conspirators until late into the night. While your friend Sam Adams gets a huge statue down the road, we know who the real brewers were, right? Women. Paul,my love, I am not saying that you and the other "founding patriots" of the day don't deserve recognition for your commitment to an idea that a society could be different. 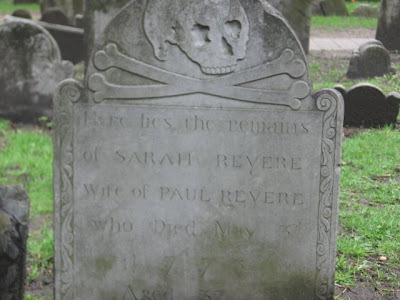 I am merely suggesting that the visitors to this grave yard do as Abigail Adams later exhorted her husband John - to "remember the ladies and be more generous and favorable to them than your ancestors." Yes Paul. She thanked me. She thanked me for weaving the fabric of the country with my body and my work. She thanked me for feeding and cooking and bearing new citizens. She whispered that it is not an act of heroics, or lofty speeches that make a patriot, but the unending toil that is life.